Have you tried riding an electric bike yet? 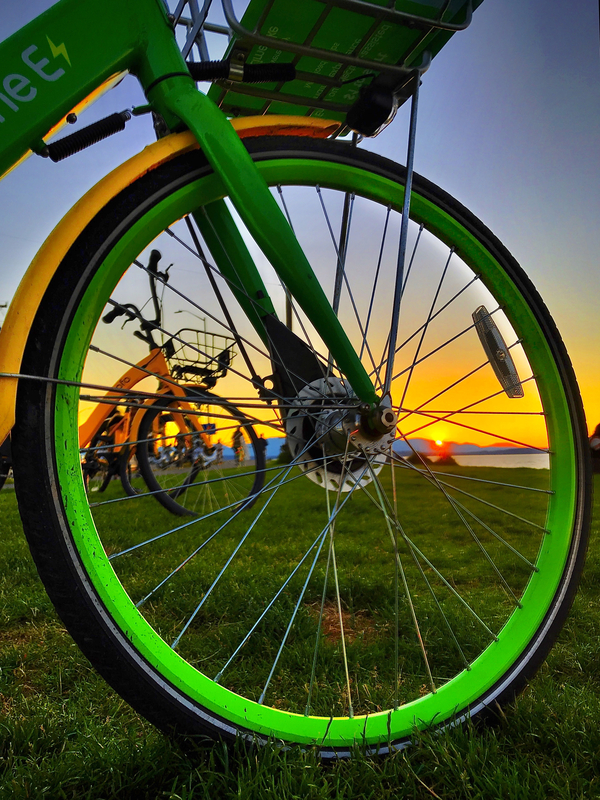 The West Seattle Transportation Coalition (WSTC) held its monthly meeting Thursday night, where managers from Seattle’s two electric bike ridesharing companies, JUMP and Lime addressed the coalition. Kian Mousavi, senior operations manager at JUMP, and Isaac Gross, general manger at Lime, each gave 15-minute presentations, discussing the impact their programs were having on public transportation in Seattle. Launched in 2013 and now acquired by Uber, Mousavi said that JUMP operates in 18 cities across the U.S., and has been beneficially impacting traffic in Seattle. This is JUMP’s first year in Seattle. When JUMP launched in Sacramento, the company found that six months later, more Uber users were using bikes over cars, for two to three mile rides. Mousavi said a similar pattern is happening in Seattle. “Basically, short Uber rides are becoming JUMP rides, which is great,” he said. As the company continues to operate in the city, it’ll be able to collect more data, which will be useful to both the company and the City of Seattle. Mousavi said that letting users leave bikes wherever they choose — and not in a set docking station — makes the program more convenient. Additionally, the company is “not constrained by infrastructure and docks, so we can shift our bikes to where the demand is,” he said. The bikes go up to 15 mph, are accessed through the Uber app, have wireless connectivity and an integrative locking system. They use lithium iron batteries, and every charge lasts 20 to 40 miles. The fact that the bikes are electric, attracts more users, especially in a hilly place like Seattle. “We also see that the bike share attracts more female riders and older cyclists,” Mousavi said. The bikes cost 15 cents per minute of riding. Low-income riders who own a reduced-fare Orca card, can ride for five dollars per month. “Right now, we’re trying to implement incentives for having people park well,” he said. The company also helps its host city. Gross, general manger at Lime, said that Lime bikes put the fun back into commuting. While technology has changed how people live their lives, transportation has been the same, he said. Gross talked about how working with the city is imperative for the company. When the Viaduct closed, King County Metro reached out to Lime, and coordinated a discount code for commuters. Lime has had over 2 million bike rides in Seattle, Gross said. From July of 2017 to March 2018, people have ridden over 103,000 miles on the bikes in West Seattle. "We really enjoy working in Seattle, and are looking forward to being here,” he said. One West Seattle resident, who attended the meeting, had some pointed questions for the companies regarding safety. She said she works downtown and takes public transportation. He also said the company is continually educating riders on were to leave the bikes, and that the company is trying to create incentives so people park correctly. The woman who brought up the issue, continued pressing the rideshare managers. "When I get hurt tripping over one of your bikes, who do I send my medical bills to?” she asked. Mousavi admitted that while the company contacts offending riders, there is no penalty and no plan about what to do in the future. “When we receive a call about a bike being left improperly, we do note it and contact the rider, and tell them not to park in that spot again,” he said. “But we don’t have a plan for repeat offenders." Furthermore, Gross said it’s not entirely the responsibility of the company. Deb Barker, WSTC board member, asked if there’s an easy way the public can notify the company if someone sees a bike that’s not parked well. Gross replied that yes, there is number to call, and it takes just one click to find it on the website. Another West Seattle resident asked if the companies are receiving any subsidies. “There are zero subsidies,” Gross replied, who noted that the only time the company got a subsidy was when it launched its pilot program on Mercer Island. “Generally, not only do we not get a subsidy, we pay,” he said. The WSTC went over a draft of the coalition’s EIS scoping letter to Sound Transit board members, the stakeholder advisory group and the elected leadership group who will be determining the preferred alternatives for the light rail extension. The letter said there must be at least two alternatives moving forward, including an elevated rail option and a tunnel option. Lately, West Seattle residents and businesses have been concerned that Sound Transit will move forward with elevated rail instead of a tunnel, which they fear will damage the neighborhood.